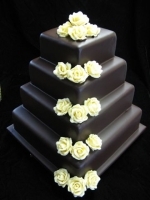 An eye-catching design, matching many of this season’s bridesmaid’s dresses, this cake can be made in either milk, dark or white Belgian chocolate curls – or all three together – complementing your choice of flowers. 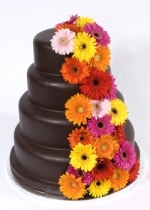 A fun and funky design incorporating dazzling fresh gerberas tumbling down a smooth, glossy chocolate covered cake. A more subtle effect is achieved by using gerberas in just one colour, to match or contrast with the colour scheme for the wedding. 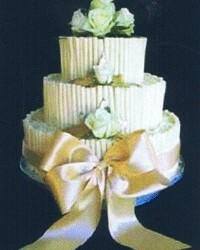 This design is sufficiently eye-catching to make a real centre-piece of even a one or two-tiered cake. 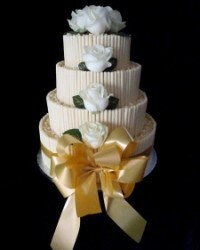 Our popular Elegant White cake, shown here with four tiers and with silk flowers replacing the fresh roses. 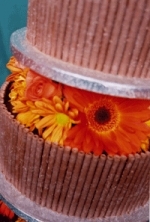 The silk flowers are ideal if you are wanting the cake to be delivered the day before the wedding, or to keep after the wedding. 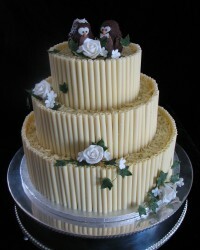 This design offers you a great twist on a very classical looking cake as it is decorated with white Belgian chocolate curls. 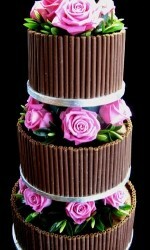 The cake is equally impactive, if less traditional, with milk or dark chocolate curls. 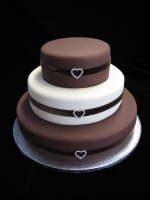 Tiers of rich dark chocolate cake covered in a smooth chocolate fondant, and a contrasting light and zesty lemon cake covered in white chocolate fondant. The tiers are finished with matching ribbons and some fun figurines on top. The figurines can be replaced with various other characters, or flowers. 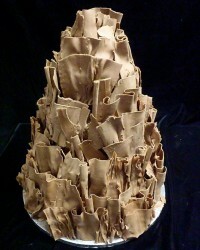 This dramatic looking cake has ruffles of milk Belgian chocolate encasing 4 tiers of sponge or a rich moist chocolate cake. 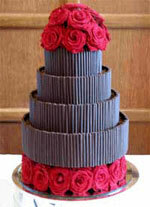 Four sumptuous tiers of rich chocolate cake covered in a smooth mild dark chocolate glaze and decorated with Belgian chocolate roses. Utterly edible!